Opening Your Third Eye… A Powerful Practice That Really Works! Opening your third eye is absolutely possible for you, especially when you learn this practice for bringing about your third eye awakening. This is a practice that I originally learned from Samuel Sagan (founder of the Clairvision school), in his book called Awakening The Third Eye. I've modified the practice Sagan shares slightly for my own personal use and based on guidance from the angels. I can assure you that this practice works because I have been having some seriously profound results doing this. My third eye has already been on for some time, but now that I’ve been doing this practice every morning for the past three weeks or so, it's really brought about my own third eye opening to the next level with very vivid, colorful, and almost psychedelic visions. And so, wherever you are on the spectrum of third eye opening, whether your third eye is always open, if you’re just starting to see little flickers or light in your meditations, or you feel like your third eye is completely closed… I think that this practice will be very helpful for you. However far you progress with opening your third eye, and in your spiritual growth really, there is always a further. Also, I want to point out that when it comes to turning on your third eye and psychic vision, I call this a practice for a reason. Rather when you keep returning to this practice, when you do this every day, when you repeat it, and return to it often, you will be able to open further and further your third eye and clairvoyant vision. Opening your 3rd eye empowers you to not only clearly see in the realms of spirit and see beyond the veil into the higher dimensions, but also to receive clear guidance, insight and intuitive impressions. Find a place where you can sit comfortably and relax. I highly recommend you do this practice sitting up rather than laying down, and when you do it you want to have your spine aligned upright, straight and vertical (so don’t lean back in your chair… But rather sit on the edge with your back perfectly straight). So sit in an upright position, close your eyes, and shift your awareness within, focusing on your heart center. Allow your heart to open, filling with golden light. Allowing your inner divine solar light to brightly shine within your heart center, and as you tune into this just take a few minutes to breathe, relax and become fully present in this moment now. As you allow your heart to open, by focusing your attention within it’s center… Tune into the tingling, warmth and glowing light within. Allow your awareness to enter into the center of your heart, moving deeper and deeper within with your awareness until you feel your heart light begin to naturally expand around you. Then let the heart light rise up. So your heart light begins to rise up in a column of light, at the very center of your being, up from your heart, all the way into the center of your mind and into the center of your mind's eye. Let the light enter into the center of your mind's eye and when it does it will begin to expand around your head… Glowing with warmth and light. Shift your focus slightly so that you’re focused on the front area of your third eye, which is between your eyebrows and up a little bit. Don't try to find your third eye’s location logically…. Rather, allow your attention to focus in the middle of your forehead, and just look for a tingling sensation. Look for any sensation really, look for some energetic indication as to where your third eye is. When you find the sensation of your third eye… Tune into that tingling, glowing, warmth, slight pressure, or whatever it is you feel in the center of your third eye. Once you feel the energy, focus on it entirely. Imagine that you're moving your awareness to the center of that sensation. Continue moving your awareness deeper and deeper into the center of your third eye. I experience this moving into the center as a sort of feeling like going in and back, and opening up. So look for and feel this continuous pull into the center of your third eye. Remember to stay relaxed! Be sure you keep your face relaxed, your jaw, neck and shoulders relaxed, you may have a slight tendency to try to strain or look for something … Let that go, just relax, and focus on the tingling sensation and glowing in your third eye center, allowing whatever appears to be okay and if nothing appears, let that be okay too. Continue with this process of drawing your attention further into the center of the center of the center of the center of your third eye. As you continue doing this, you will reach a point where your conscious awareness begins to move through the etheric body, which is indicated by the tingling, glowing sensation and warmth you feel. You’ll then move into the astral body, which presents as color, light and visuals. So staying focused on the feeling sensation of your third eye, and moving deeper into the center of your third eye until you begin to see the light flashes of light flickering, light color geometries, or anything else. Allow whatever you see as okay… Again, you're not trying to visualize anything, or to even decipher what you see. You're just observing and allowing light or visuals to naturally appear if they do, and if they don't, continue to focus on the tingling, the sensation, and upon whatever you feel within your 3rd eye center as you keep going deeper and deeper into that feeling. Feeling is key, because that is what then brings the next layer into focus, which is the light and color. Know that when visuals naturally begin to appear, your mind will have a tendency to grasp for them. You’ll naturally try to focus in on what you’re seeing, at which point, the visual may fade away completely. When this happens… Relax. Let go of the need to grasp, and just observe. Refocus on your third eye center and observe the sensations, observe the light, observe the colors as you continue to move deeper and deeper within. 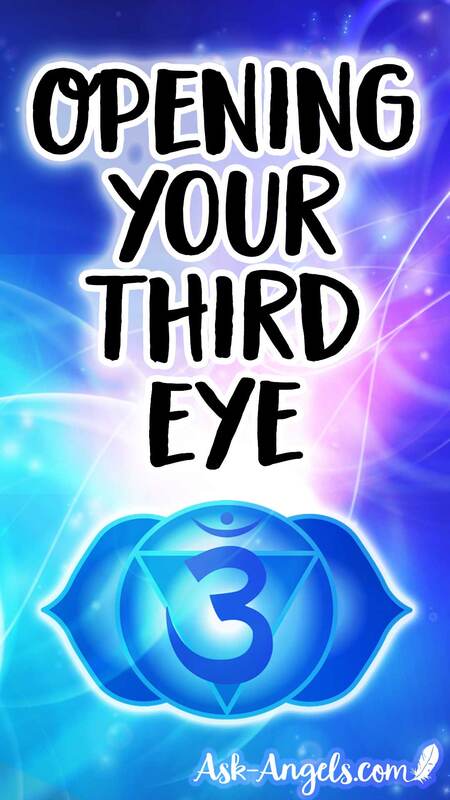 Through moving in and back with your consciousness… Containing to be pulled into the center of the center of your third eye, you naturally will reach a point in this inward movement where your third eye activates, and begins to expand out and radiate light out. Just allow this to happen. You may begin to feel a slight spiraling energy, and you may begin seeing more colors… Just allow whatever does or does not happen to be okay. Continue to focus on the inner screen before you, and on whatever light, color, or sensation arises as you continue moving into the center. Relax, allow this to be, and focus on that continuous movement deeper and deeper into the center of your mind's eye. As you stay with this practice, visuals, guidance, imagery will come in and when it does, your mind will want to focus in on it… So know this, and let go of the minds need to grasp at whatever appears. Allow yourself to just be present observing, receiving and witnessing whatever appears. Once you get to the screen of solid, dark purple space and light, you can then begin to expand your awareness around your body, observing your surroundings through your inner vision. Stay relaxed, and with your inner eye, observe and notice… What do you see around you? Are there spiritual beings with you? What other light, geometries and colors are with you? As you continue this, your guides, the divine or the higher realms of Spirit may begin to reveal something to you through your vision as you open your mind's eye. 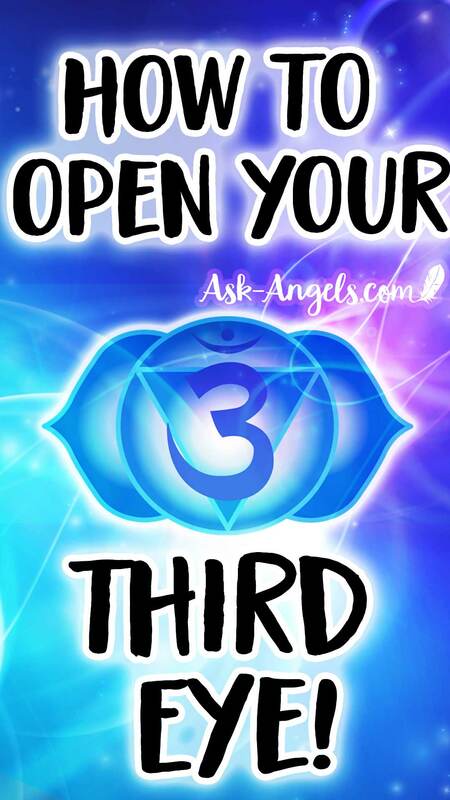 Keep with the practice, and know that as you further open your third eye more will be revealed to you. Okay, so that is the practice. Know that opening your third eye is possible for you. This is a biological function of your body to be able to see beyond the physical, but you're simply used to focusing on the physical realm. And so it takes practice, to calm the minds need to grasp so you can relax more fully and allow the opening to unfold. Clairalience – The Psychic Gift of Clear Smelling! Do You Have It? What is Clairvoyance… And How You Can Become Clairvoyant Too! 5 Psychic Empath Types… Which Are You?